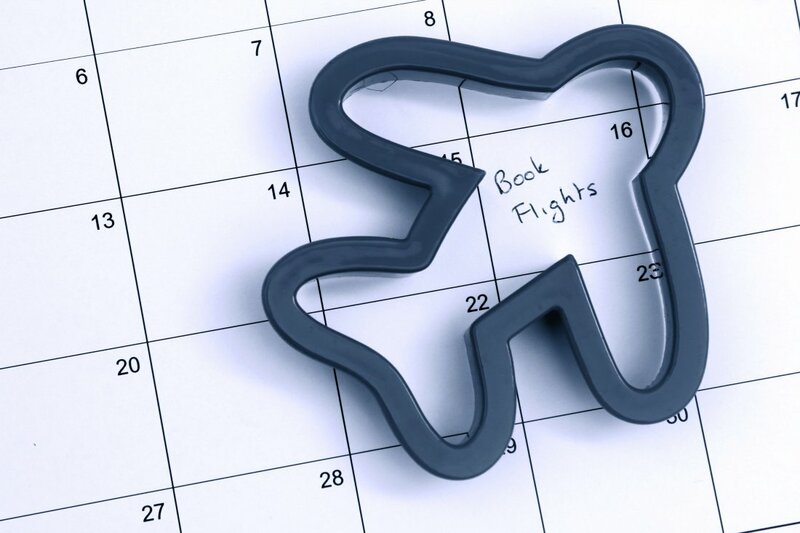 A few weeks ago I received the green light to purchase plane tickets to Nigeria. 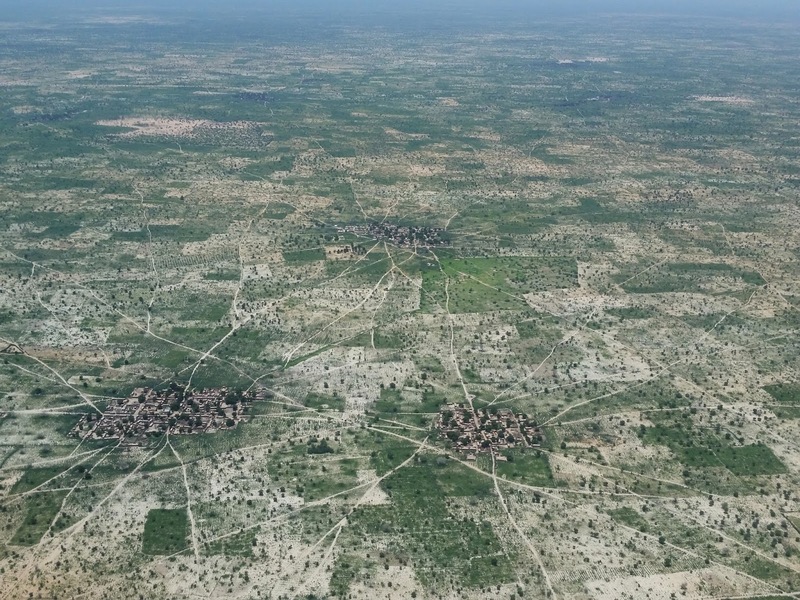 All of my one-time needs are met, my monthly goal is in the process of being reached by generous donors, and the Nigerian SIM office is expecting me in time for the annual patient reunion at Evangel VVF center. Just before Christmas, dad did a preliminary search for flights and was amazed to find that I would fly to Nigeria for 40,000 airline miles, with a wide choice of departure dates, and only one-stop. And to top it all off, that connecting airport was in Europe! 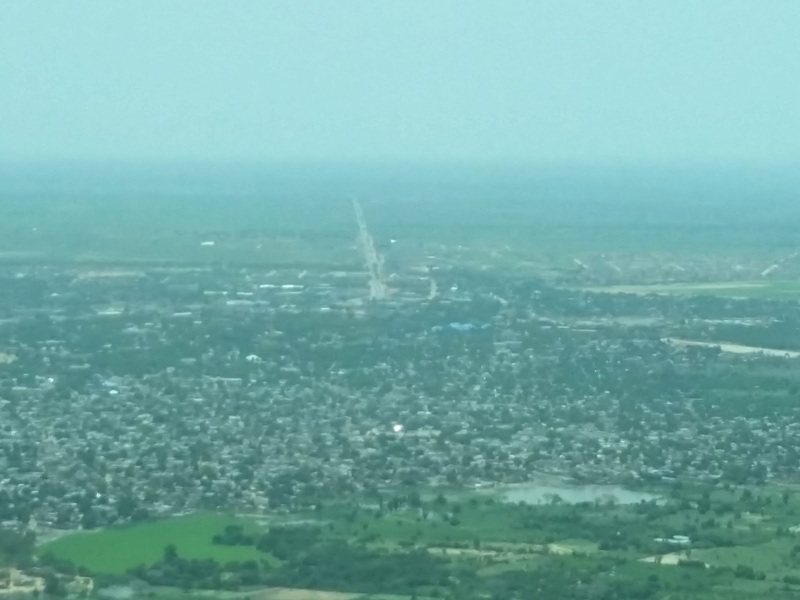 My parents and I have flown in and out of West Africa many times over the last 6 years, and it's always taken at least two stops, usually with a transfer in Ethiopia, Kenya, or Morocco. 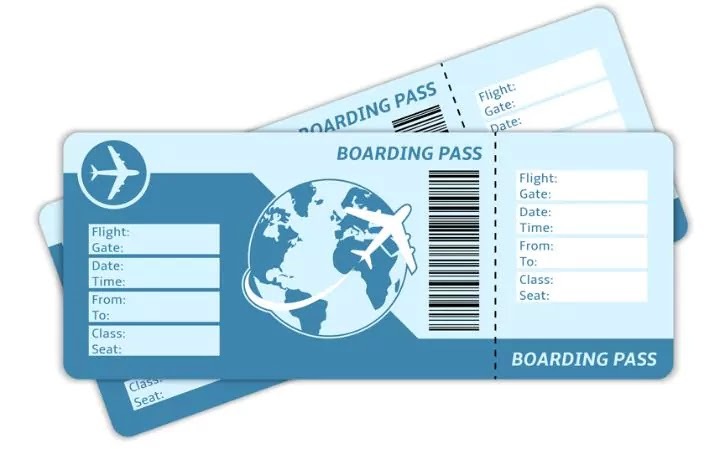 We've usually flown with just carry-on luggage so we didn't have to worry about losing a bag, or having to deal with airline customer service in some other language. I have been praying that God would provide a way for me to fly directly into Nigeria without an in-continent transfer. God provided! Next, I pulled up my account to find that I had 38,000 miles which have all been accumulating since I was 7 and took my first flight with this airline. Dad transferred the remaining two thousand miles to my account, and that small fee combined with the required airline taxes and fees meant that my one-way ticket from Texas to Nigeria cost less than $300! 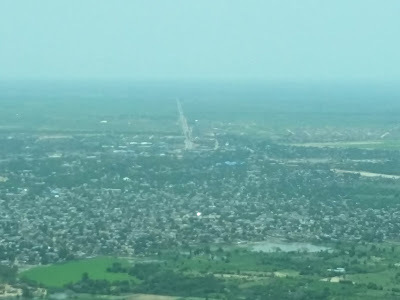 I had budgeted nearly $3000 for airfare, so I will be able to redirect that money to other needs, allowing me to bless patients at Evangel hospital as needs arise, or contribute to SIM projects there in Jos, Nigeria. I leave for Nigeria the last week of February (exact date not published online for security reasons), and this whole process of buy airfare is just another instance of how God is both confirming His leading to Nigeria, and showing me that He's already gone ahead of me to prepare the way. I am humbled and very grateful! Does Santa carry anything besides gifts in his sleigh? Last week I was standing in line at our local post office, and felt out of place. Everyone else was trying to send out Christmas cards, mail off gifts to family and friends in hope they'd arrive before Christmas, or simply buy rolls of stamps to send out end-of-the-year business mailings. I stood there with my expedited document mailer, trying to get my passport renewal application to the Department of State in Washington D.C. Once that's renewed, I will send it off to the Nigerian Consulate to apply for my visa. Just like everyone standing in line, I was wishing for Christmas weather (it turned out to be 75* on Christmas day! ), making mental grocery lists to stock the fridge in preparation for having company, and looking forward to spending time with those I love. But I was spending my $22.95 postage fee to send an envelope to a government office in D.C. instead of mailing a box to a family member in Florida. My package contained paper forms and money orders, not fuzzy socks and new toys. But we were all spending our precious holiday time standing in line to make sure our important packages arrived on time. This isn't the first time that I've felt out of place in this town. This isn't the first time that I've realized I'm heading down a different life path than most other Americans. But this was the first time I was actually excited about it! Who knows, maybe Santa carried my envelope in his sleigh and made a stop at the passport office on his way to bring gifts to Malia and Sasha at the White House! 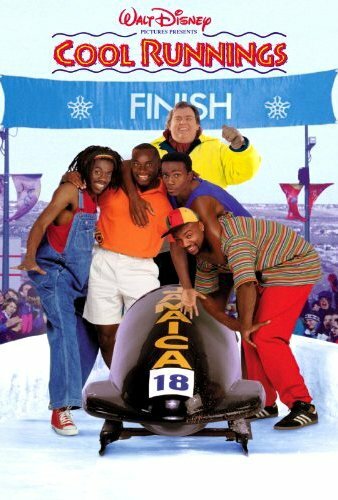 And on that note, I may have to go watch "Cool Runnings" again with my parents tonight. You can never have enough sports movies, feel-good moments, or come-from-behind-to-win stories! This quote starts off a chapter entitled Learning: Seeking Information That Changes You from the book Cross-Cultural Servanthood that I've been reading through the past couple of weeks. While I've viewed myself as fairly astute in traveling cross-culturally and I have even lived cross-culturally, I'm discovering how much I really have to learn about ministering and serving cross-culturally. What may be viewed as service in the American culture may not be understood as service in another culture--or worse yet, can even be offensive! When we read about Jesus washing His disciples' feet and following the Jewish custom of servanthood, what do we as modern day, Western Christians think? 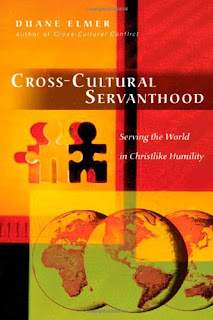 We know it's supposed to be a model of servanthood, but it really has no cultural relevance for us Americans. I've personally been at seminars where the main speaker literally washed some of his staff's feet in front of all of us. I've also been at weddings where the bride and groom washed each others' feet. We all knew it was supposed to symbolize ultimate service. But the actual act had lost its significance. In fact, if someone were to wash my feet now, it would be odd and embarrassing! I wouldn't feel honored, and I certainly wouldn't feel like I'd been served. It's the same way with many Western acts of service. 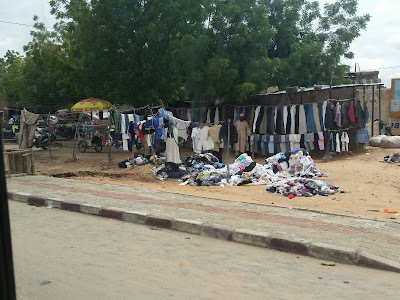 We assume that giving clothes to the poor, meeting someone at a coffeeshop, cleaning the home of a new mom or an elderly person, offering money to help out someone in a tight spot, or giving up our free evening to spend time with someone, will come across to the recipient as acts of service. We certainly mean to help out and to serve the other person--yet the recipient may not view it as such. I would submit to you that it is not the duty of the recipient to try to understand that we meant to serve them, it is our responsibility to perform acts of service that are culturally relevant to the recipient. I would highly recommend this book for anyone serving in any capacity, and in any country--including America. As the US becomes more culturally diverse, we must make sure that our servant model of being Christ's hands and feet is culturally appropriate. So how we do that? How do we start to identify acts of service in our own culture and then seek out how to serve in another culture? We must start by learning. We must start by learning about the other culture, learning from someone in the other culture, and then learning with them. And when that happens, I think we'll agree with Elisabeth Elliot that "when I began to know him as a person, things were no longer simple." It's Thanksgiving Day today. It's a time that Americans give thanks for the many blessings we've received--and in recent years it marks the start of the craziness surrounding Christmas! The Wednesday before Thanksgiving, many people are cooking the pies and all the side dishes, and frantically cleaning their homes before the massive family gatherings on Thanksgiving Day. However, my parents and I went to the local jail instead. Mom, Dad, and I have been involved with jail ministry for the last two years. I remember the first time I walked through the doors of our local county jail, through the metal detectors, past the guard station, and was escorted down the long hallway with separation cells on each side, all the way back to the multi-purpose room in the female wing. I remember that I wasn't afraid of the inmates themselves, or of any physical harm; I was scared that I wouldn't have anything to say, that the inmates would right me off as a "goody, goody two shoes," and that everything I said would fall flat. While none of that happened, the first couple times Mom and I did a tag-team approach until I felt comfortable enough to lead the group. We never know if we'll have a group of 3 or 13, if there will be one group or 5, if we'll have 15 minutes or over an hour with a group, and if we'll be all together in the multipurpose room, sitting in the middle of the hall, or talking with ladies in separation cells through the slit in the door. I never know if the inmates will be antagonistic towards the gospel, have a vastly different view of Scripture/God (as was the case with several Mormon inmates we spoke with), if all they remember of the Bible is from stories learned at Grandma's feet, or if they are indeed Christians and are using their time in jail to draw closer to Him. But I know that I can count on God to show up. I know that the presence of God is not bound by cinder block walls or high security systems. I know that Jesus loves these women like He loves every other human. I know that God answers prayers prayed kneeling on a concrete floor from the mouth of a convicted person just as much as He answers prayers from the pulpit in the largest church. And I've experienced a little bit of what Paul and Silas went through as they were singing in the jail at midnight (Acts 16). I tell you, these women can sing! I usually try to talk about a Bible story when it's my turn to go to the jail. Only a few of the inmates have a Bible, or one that's in a large enough print or in an easily understood version. And we all like to hear stories, especially when we can relate to some of the characters. Abigail paused at the doorway and looked back at the bed. The man snored under the covers. It was nearing noon, and he was still asleep. She picked up the water jar by the door. When he awoke, he’d want water, and if it wasn’t there, she’d hear about it all day long. Why did she keep making the same mistake with guy after guy? They’d all seemed so nice to her at first. But this one was a loser, just like the rest. She took a deep breath at the door. Outside, she would have to face all the whisperers. What a life. Once she stepped outside, Abigail kept her eyes to the ground in case she accidentally made eye contact with any of the other women. They hated her, she hated them.Was it her fault that men found her attractive or enjoyed her company? But at least they had their original husbands. After walking across town in the hot sun, Abigail was ready for a deep drink herself. She rounded the corner and stopped in her tracks. A man sat on the stones by the well, and by the looks of him, he was a Jew. Just great. What should she do? She picked this time of day to avoid talking to anyone, and this Jew was sitting right there. What if some of the women walked by and saw her standing there alone with him. They’d draw all sorts of conclusions. But Abigail couldn’t go home. If she returned without water, the loser back home would just send her back out again. She took a deep breath and walked to the well, as if the man wasn’t even there. She stole a glance at him, and realized that he looked tired. She started to lower her jar into the well. She froze. The Jew had just talked to her. Jews didn’t talk to Samaritans; they seemed to think that her entire race was a bunch of half-breeds. And no man ever talked to her without expecting something in return. Was this guy trying to stir up trouble? Huh? The Generosity of God? The sun must be making him lightheaded! Abigail was puzzled. At any other time, and with any other man, she would have simply ignored him as a crazy person. But as she studied his face, she realized that he wasn’t crazy. And strangely enough, in this man’s presence, she felt safe! Abigail’s eyes widened. How could he know that! She’d never seen him around before. And as a foreigner, he couldn’t have been hanging around town and listening to the gossips. Surely, he would have been discovered. Abigail took a deep breath and steadied herself. There was only one way that he could know this about her. But she still felt the need to remind him how different they were. She went numb. This was all too incredible. The hope of the centuries claimed that he stood right before her. Surely he was toying with her… But no, he knew about all the other men, and how could she explain how she felt in his presence? Part of her felt like a little lost girl whose father found her in the woods, and part of her felt very, very afraid. Just as she opened her mouth to speak, she saw other Jewish men approaching. The looks on their faces showed they weren’t too pleased to see their friend talking to her. And it was well known that Jewish men didn’t tolerate a woman with a lifestyle like hers. She dropped her water jar, turned around, and ran back to town. She ran past the women standing outside the market, and right up to the men of the town. Her chest heaved as she tried to catch her breath. They looked at her like she was crazy, but boy did she have a story to tell them. 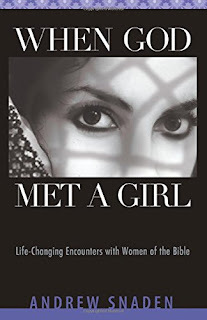 She’d just met the Messiah and this was something she couldn’t keep silent! Mom and I talked through the story with the women, asking questions and pausing to place ourselves in "Abigail's" shoes. We thought about why Jesus "needed to go through Samaria," why He planned to arrive thirsty at the well so He would have something to talk about with the woman, what tone He might have used when exposing her past failed relationships, why He might have chosen to speak to her in order to reach the men of the village, and how the gospel spread throughout the region because of her. On this Thanksgiving Day, I am thankful for a God who goes out of His way to talk with the lowest of the low. I am thankful for a God who looks beyond my past as simply fact. I am thankful for a God who exposes my true needs, even when I throw up smoke screens and try to distract Him. I am thankful for a God who invites us to worship Him in our hearts, doing away with the need to go to a specific place. And I am thankful that even though these women may be behind bars, we can worship this great God together. 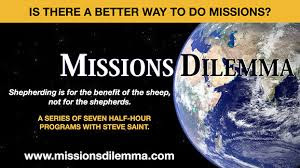 One of the courses the SIM organization requires for long term missionaries is called "The Missions Dilemma." It's a 7-part video series and workbook that's designed to open the eyes of North American Christians to how it feels to have "missions done to us," and thereby change how we live and serve cross-culturally. Much of it is information that was originally presented through the Perspectives course I took earlier this year, or are thoughts I've had while participating in short term mission trips over the last few years, but it's very helpful to have it presented in a concise manner. Steve Saint is the course author/presenter. If his name doesn't ring a bell, what about the name Nate Saint? Or Jim Elliot? Steve's father and three other men were killed while reaching out to the Auca people in Ecuador in 1956. Steve's family continued to minister among the Auca people, and later Steve and his sister were baptized by two of the very same warriors who had killed his father. Steve went on to write the book "End of the Spear" which was turned into a movie in 2005. One of the things I like best about the video sessions are the interviews with non-American Christians, many of them missionaries themselves. Their honesty as they talk about their experiences with North American missionaries coming in to do things for them, to identify their communities' needs and then design a master plan for meeting those needs, and to build churches with cement and galvanized tin roofs (completely foreign materials for many people groups!) is tough to hear. But I've seen it myself. 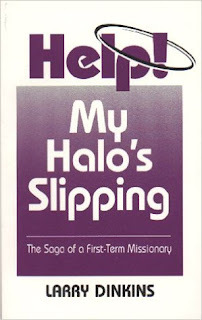 I've committed many of those same mistakes in missions myself. I'm starting to realize that simply by being white, I have influence (and often power) in many other cultures. Even if I were to live in a mud-brick hut, sleep in a hammock, and cook over an open fire, I would be viewed as wealthy. Even if I have a completely empty bank account, I'm viewed as rich, simply because I could pick up the phone and call someone who could send me money. Simply because I'm American, my words have clout. And most American missionaries don't even realize this. We dominate people simply because of who we are, and without concerted effort to build relationships and come in as learners, we will end up dominating and suffocating the very people we've come to serve? How much better it would be to come into a community as a learner and to build relationships before I ever begin to open my mouth? 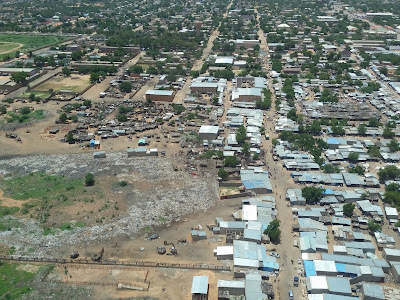 How much more could I accomplish by partnering with the local body of believers, or by seeking out the "man of peace" that is open to the gospel? 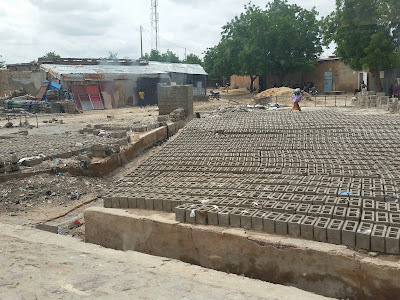 How much more sustainable would a building project or healthcare initiative be if I would assist the local people in doing for themselves and doing it in their own way with their own materials? Much of my first term on the mission field will be dedicated to building relationships and becoming a student of the Nigerian culture. Praise God if I get a physical therapy clinic up and running or if I can start assimilating some patient data for a future research paper. But since I'm in this for the long haul, I MUST make sure that I build relationships that will last my entire missions career. The missions dilemma is this: I want to "go and do." My supporting churches and friends are expecting me to report back results and numbers. However, I cannot burn bridges and dominate the very women I'm going to serve. 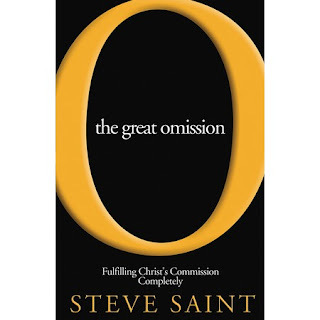 If you're interested in reading more about this topic, you can sign up for Steve's email list on the website here, and get his book, "The Great Omission" as an e-book for free. What do you think? Are any of these new thoughts for you? Feel free to write a comment below and let's dialogue some more. And for anyone who's looking for a good group video series, this is it. It's pertinent for any American Christian, whether serving as a missionary, supporting a missionary, or simply engaging with God's heart for missions. Last week, as we were going through a couple of sessions on valuing others and cross-cultural team building, we were presented with the following scenario. Once there was a girl named Abigail who was in love with a boy named Gregory. Gregory had an unfortunate accident one day and broke his glasses. Abigail, being a true friend, volunteered to take them to be repaired. The repair shop was across the river, and during a flash flood the bridge was washed away. Poor Gregory could see nothing without his glasses, so Abigail was desperate to get across the river to the repair shop. While she was standing forlornly on the bank of the river, clutching the broken glasses in her hand, a boy named Sinbad glided by in a rowboat. She asked Sinbad if he would take her across the river. He agreed on the condition that while she was having the glasses repaired, she would go to a nearby store and steal a transistor radio that he had been wanting. Abigail refused to do this and went to see a friend named Ivan who had a boat. When Abigail told Ivan her problem, he said he was too busy to help her out and didn't want to become involved. Abigail, feeling that she had no other choice, returned to Sinbad and told him she would agree to his plan. When Abigail returned the repaired glasses to Gregory, she told him what she had done. Gregory was so mad at her behavior that he told her he never wanted to see her again. Abigail, upset, turned to Slug with her tale of woe. Slug was so sorry for Abigail that he promised her he would get even with Gregory. They went to the school playground where Gregory was playing ball and Abigail watched happily while Slug beat Gregory up and broke his new glasses. Rank the story characters from Best to Worst and give a rationale for your decision. We took a few minutes to rank the characters for ourselves, then the session facilitators counted our votes for each of the characters. 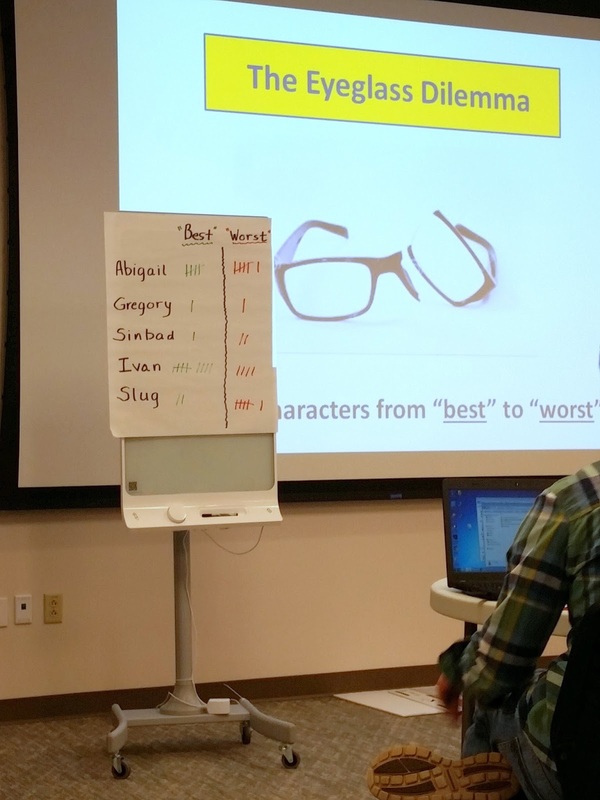 I was surprised that every character in the story was voted both "best" and "worst" by at least one person in the group! As we started to share our rationale, it was clear that our own worldview, our ideas of friendship and loyalty, our morality and absolute right/wrong, and even our emotions played into it. Some viewed Slug as the worst for taking up offenses and beating up Gregory. Others said Abigail shouldn't have stolen the radio, no matter what. Others thought Sinbad was bad for wanting something in return for giving Abigail a ride. Ivan was blamed for not being willing to help. And even Gregory was voted the worst character for not forgiving Abigail. On the flip side, Slug stood up for Abigail, Abigail helped a friend in need, Sinbad was just being a shrewd business man and didn't have to offer her a free ride just because she needed to get across the river, Ivan didn't have to stop what he was doing to help and he was honest with Abigail, and Gregory didn't really do anything wrong in the first place. I thought it was an interesting group exercise, and it sparked a lot of conversation around our tables. I understood where each person was coming from, even though I didn't agree with it. It had been hard for me to pick a definite "best" and "worst" character as I thought each one had some redeeming qualities as well as some poor choices/wrong behaviors. Overall, working through this exercise is teaching me that what I view as right and wrong may not be viewed that way by people from other cultures and mindsets. Especially in matters regarding personnel and people's behaviors, I must seek out more information before making a snap judgement. What do you think? Did this story make you stop and re-think your initial gut reaction? This morning's sessions on building cross-cultural teams really hit me. The presenter showed us the following graphics to demonstrate how vastly different two cultures can be (in this case, European and Asian). Which side do you most relate to? How would you work with someone who had the other viewpoint? Were any of these new to you? At one point during the discussion we were talking about how to set boundaries appropriately in a cross-cultural team and one of the other course attendees who grew up in South America said, "before I came to the US, I had never even heard of the word boundaries and now it's everywhere!" It made me smile, then I realized just how much I do rely on the ability to set my own boundaries, protect my privacy, my space, and my time, and how I expect others to adhere to the unspoken rules of American culture and its boundaries. I anticipate that this will be an area I will need to grow in quite a bit when I move overseas! Greetings from SIM USA headquarters in Charlotte, NC where I'm currently in SIMGo, a two-week missionary training program. We're covering a lot of the nuts and bolts of being a missionary with SIM (getting computers set up, getting all required travel immunizations, cross-cultural and team-building skills) as well as learning effective strategies for building a support team and engaging with our financial and prayer partners. Morning chapel with all the SIM staff as well as other course attendees. 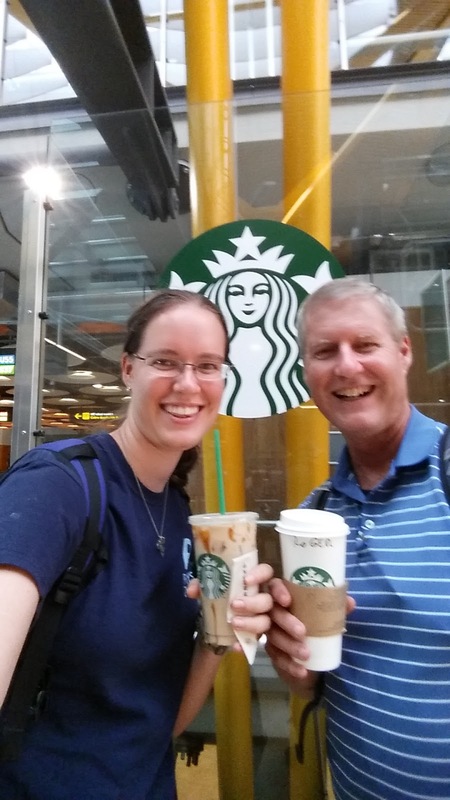 I enjoy the worship and praying for SIM missionaries serving around the world, but I'm also encouraged hearing the testimonies of my other course attendees and hearing the journey God's brought them on. The walks between the SIM campus and Gordon Conwell Theological Seminary next door where most of our sessions are held. It's a beautiful wooded campus and it certainly feels like Fall here! My roommate is incredibly sweet and we've enjoyed finding all the things we have in common! She's an MK (missionary kid) as well as a TCK (third culture kid) [someone raised in a culture other than their parents' or other than their passport for a significant part of their early development years], so we get along quite well! She likes dark chocolate, coffee, and reading, so we're off to a good start! Keep checking out the "Pray" page here on the blog to find out how you can partner with me in prayer. I'll try to keep that updated often! I was hooked after the first three chapters! I loved the candid nature of the story the author and would-become wife sensed God's calling to missions during college at Oklahoma University, picked a mission organization, went through the various stages of the application and interviews, sold all their possessions and packed up a few unused wedding presents, said goodbye to family at the jet bridge in the airport, went through language school (at #2 Cluny Road in Singapore, of all places! ), and finally made it to Thailand. I just might have purchased this book for all of my family members and my mentors! I found that Larry Dinkins' words portray the mixed emotions I'm feeling right now much, much better than I can. Their "Dimensions of the Faith" course is available online for free, with both the audio lectures and PDF workbook available for download. The courses are designed for any Christian desiring to have a better understanding of how the Bible is put together, basic church doctrine and theology, and a proper understanding of missions. Thankfully, there are very few seminary terms, so it's pretty easy to follow along! Each lesson is about 45 minutes, and the two- or three-page workbook lesson helps me stay focused. Seriously, you should go check it out! "In our own post-modern world with its radical relativism, there appears to be less and less need to be tethered to truth or tethered to historical evidence. People simply tell their own stories and allow you to tell you own—but with no absolute requirement, no rule against which all of these are tested. In the midst of that relativism, although, I'm here to remind us that for the Christian scholar, history must be a study built upon evidence. We must find those sources, study them, analyze them, and tell the story based upon what was the reality of the past rather than what we might have wished it to be. This means for the evangelical scholar that we must be absolutely diligent in our searching out of the truth rather than creating reality for our own purposes." Don't get me wrong; I'm all for "telling your own story" and recognizing each person's individuality. I believe it's important for each person to feel like they've been heard, their ideas are valid, their experiences are real, and their reactions are normal (albeit sinful at times). I agree that there are personal applications of Biblical principles. I agree that the Bible is "living and active" and that the Holy Spirit causes verses to "pop out" and enlighten us as we read. But where we can easily get into trouble is when we interpret the Bible or alter our theology based on our individual desires. However, the Bible is not a story that needs re-telling in our own ways, nor do I think it needs a "modern-day interpretation." Likewise, church history should not be retold without talking about the crusades, the Spanish Inquisition, or the Reformation. Without understanding what led to those dark periods in our history, we can easily repeat it! There's a tendency to downplay the low points of our particular denomination while tearing down other denominations. It's easy to point fingers at other religions and their heresy while disregarding the wayward teachings in our own churches today. I see that the modern-day church is becoming more and more "culturally relevant" while becoming less and less a source of truth and clarity. In our search for the lost sheep, are we drifting further and further away from the sheepfold and the Shepherd? Anyway, just some thoughts. I'm enjoying going through this course as it draws me back to the foundations of my faith, challenges some of what I've always been taught, and consistently points me back to the Scriptures to seek out the truth. I'm realizing how important it is to be firmly grounded in my own faith before leaving for the mission field. There, I know I will encounter Christianity mixed with animist (folk or voodoo) beliefs, churches that are struggling to implement Biblical worship and church government, and unique Biblical interpretations seen through the African worldview! 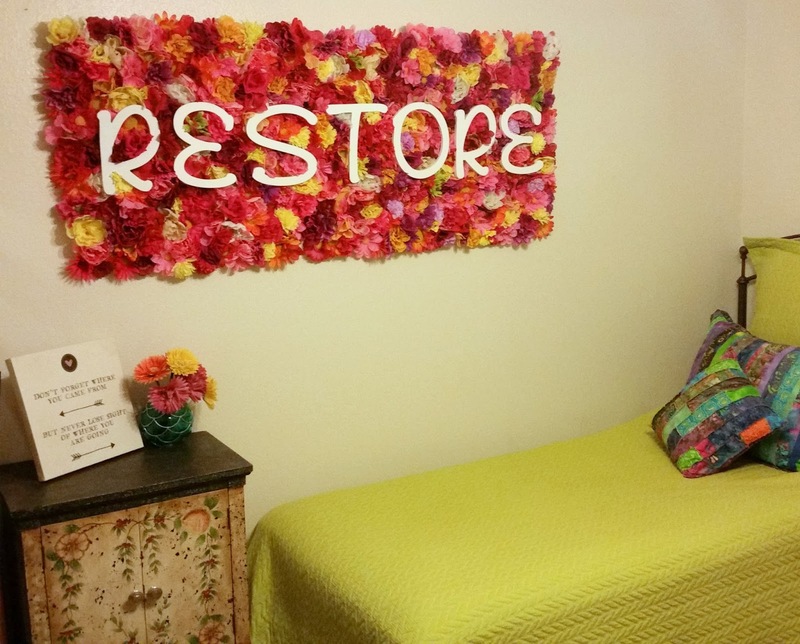 Yes, it's unusual to have a 2.5' x 5' board covered in flowers on your wall! 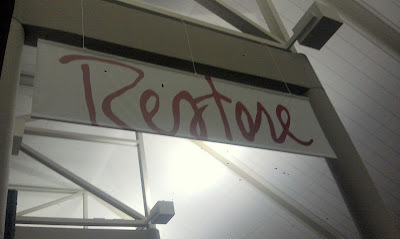 The word "Restore" has sort of become my motto. 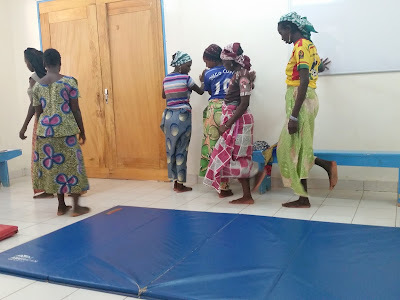 So much so, that it's part of my ministry tagline: "Restoring Dignity to African Women through Physical Therapy." God first spoke this word to me in January 2013 at the Passion conference in Atlanta, Georgia. This packed three-day conference for over 60,000 college-aged students came at a pivotal point in my life. I was 2/3 of the way through physical therapy school and about to start my first clinical rotation (which I was utterly freaked out about!) I was moving back in with my parents for a time and starting to think about job-searching and post-graduation plans. I was working through the fallout of a relationship I'd had through most of college that had recently ended, and I realized that I was losing touch with my closest friends—some of whom I'd even come to the conference with. 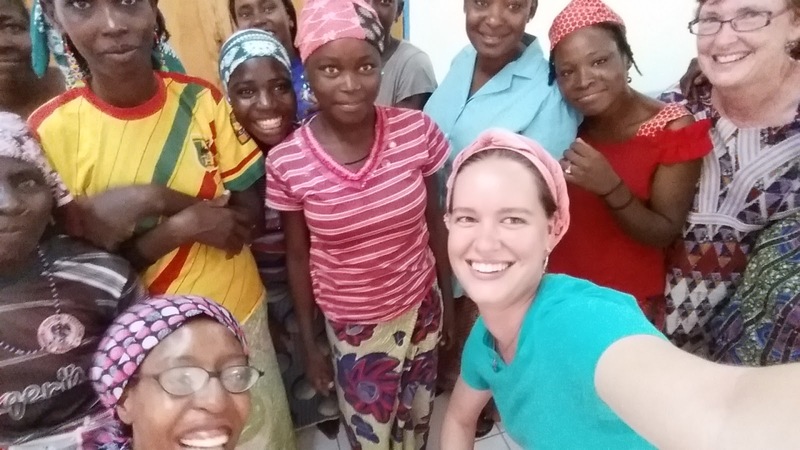 Worst of all, I felt like the dream of becoming a missionary physical therapist that God had placed in my heart during the summer I spent with Mercy Ships in 2010 was further away than ever. I remember looking around my "small group" of over 5,000 students and around my "family" of eight, and I feeling utterly alone. The main session speakers were wonderful, the worship was phenomenal, and the small group discussions helped me plan how to integrate the teachings into daily life. But I felt like everyone else was experiencing God in a real and powerful way, while God had forgotten me and my hurts and my hangups. I just wasn't sure He cared about me and my dreams anymore. It was just one of dozens such signs with words like "Freedom," "Prayer," "Courage," "Truth," and other inspirations centered around that year's theme of social justice and modern day slavery. But I couldn't get that word out of my head. "Lost in You, expectant waiting, tired of waiting, wait for Me. No shame. I'm not enough, He will equip. There's not enough time, God of the impossible. 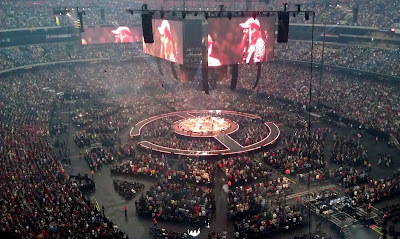 This is a generation of faith. At the death of death, power, all-consuming love, pouring out, in my place, it is enough, let go of your burdens. I will give you new skin, old dry bones replaced, dance for the first time, someone's gonna find their healing. Community, family, believing His promises. He is real, I am real, my time is now, my dream's not dead. Reshape. Network. Share. Love. Inspire. Wonder in awe of who God is. Expand my world. Rock my socks off. Restoration. He is leaving nothing broken. Restoring life. ALL THINGS WERE CREATED BY, FOR, AND THROUGH HIM FOR HIS GLORY." ***Those of you who have heard that year's Passion album, "Let the Future Begin,"
"I have not forgotten you." God had not forgotten my dreams. He had not lost me in the midst of graduate school and the angst of being a young twenty-something. But He was continuing to let me feel like I didn't fit in with my own generation, and continuing to let me struggle to identify with them. He wanted to enlarge my faith and prepare me for the real world. And as I ventured out out of the physical therapy classroom and into the clinic, He wanted me to remember that I was not in it for the money or for the personal fulfillment. He reminded me that I'd chosen that field in order to help people achieve their goals (and sometimes help them dream again), and so I could impact their lives in multiple areas, not just physically. He had not forgotten me. In fact, He was just getting started with me. God continued to speak that word, "Restore," to me the rest of 2013 as I worked with physical therapy patients from all walks of life, with all sorts of injuries, and with vastly different goals. I thought He was leading me to a high-class and fast-paced clinic in Boston, but instead I found the perfect job at the small county hospital in rural East Texas where I started working in March 2014. And somewhere in the mundane of the 9-5 job and small town life, I kind of forgot about my dream. I still wanted to be a missionary, but more in the "maybe one day" sense of the word. I had gotten lost in the never-ending pile of patient documentation, learning all the real-world skills they don't teach you in PT school, and in pursuing various volunteer and continuing education opportunities that didn't really lead me any further towards the mission field. 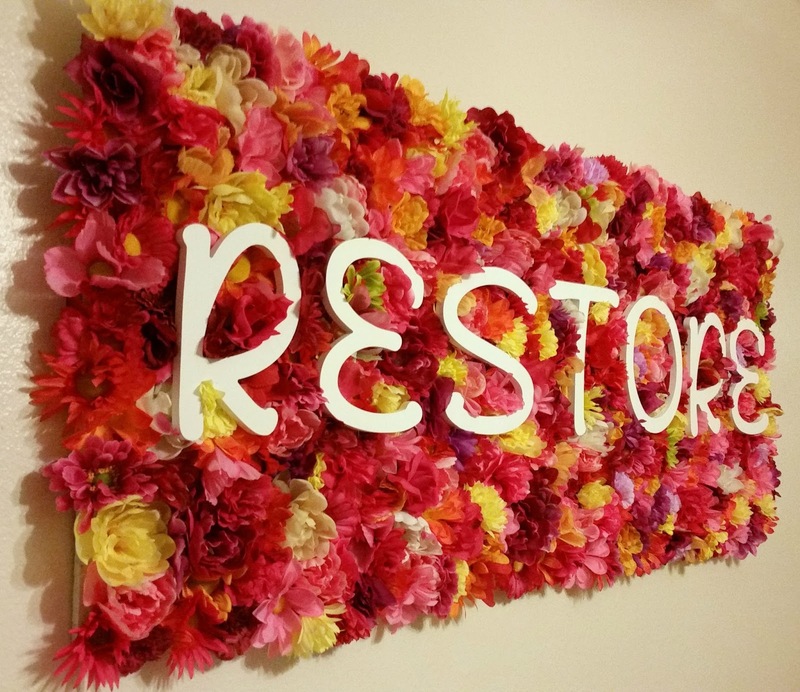 I made this wall hanging to remind me every day that my goal is physical restoration. I started to see my patients in a different light: restoring a high school athlete to his pre-injury status, restoring life to an older person undergoing surgery, restoring intimacy and dignity to a woman with pelvic dysfunction, and restoring sanity to a caregiver that was simply overwhelmed. Now that I'm on the road to becoming a missionary physical therapist, I'm excited to join God in the restorative work He's already doing overseas! I'm partnering with a Christian organization and will be working at a Christian hospital, so will have unrestricted ability to share the gospel with my patients. 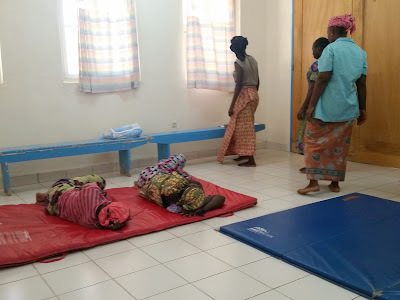 In working with fistula care, I will have the opportunity to really build relationships with the women who are at the center for several months. And as I combine my physical therapy skills with others bringing their surgical, nursing, life skills, and evangelism training, we will have the unique opportunity to bring total restoration to each of our patients! To read about the first part of my trip in Nigeria, click here. 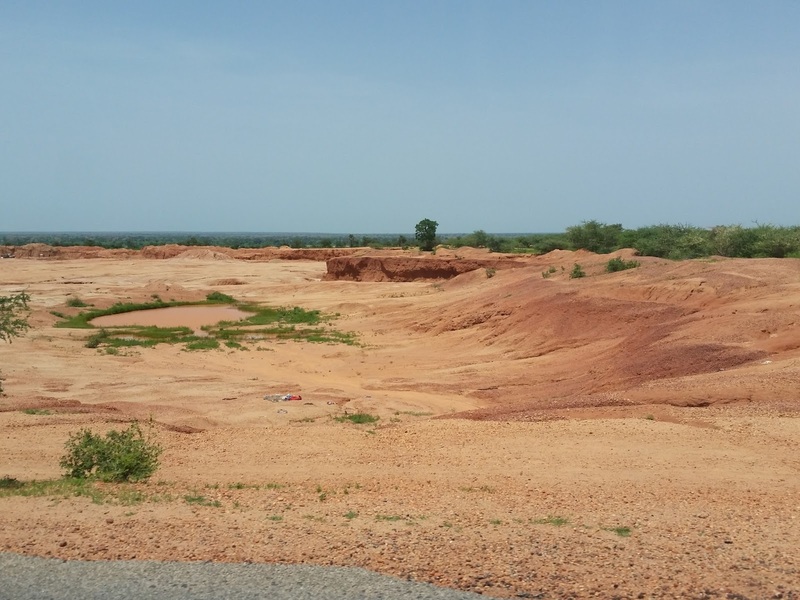 To read about the second part of my trip in Galmi, Niger, click here. 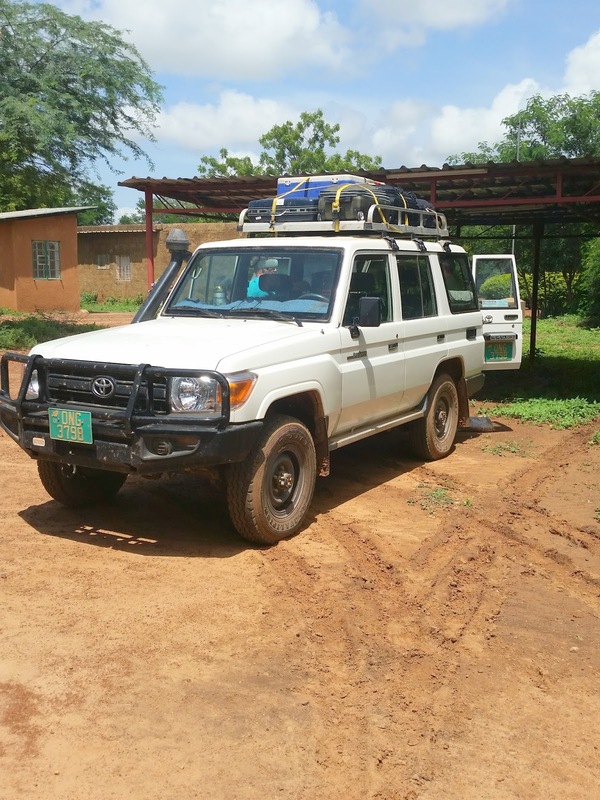 After eating yummy cinnamon buns on Wednesday morning, we loaded up into the car, strapped our bags on top, and drove about three hours to the SIM hospital in Danja, Niger. 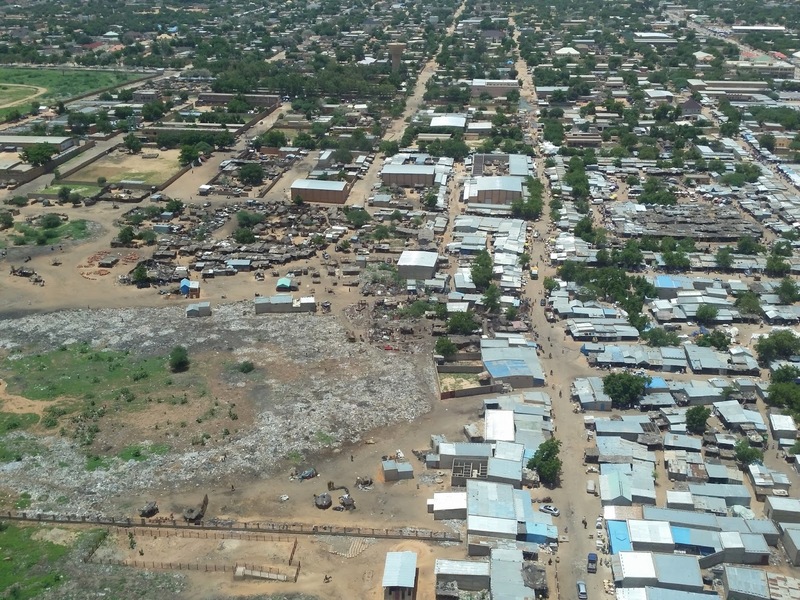 We passed through the town of Maradi on our way to Danja. Maradi is the local government center (similar to a state capital), and it has a small airport that appears to only be used for private or chartered planes. 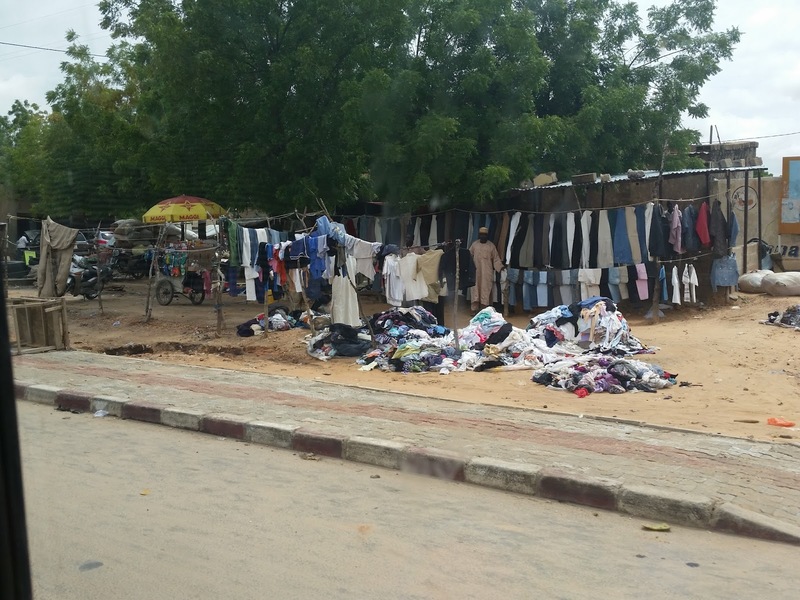 Maradi is only about 20 miles north of the Nigeria border, so a lot of trade goes through Maradi. 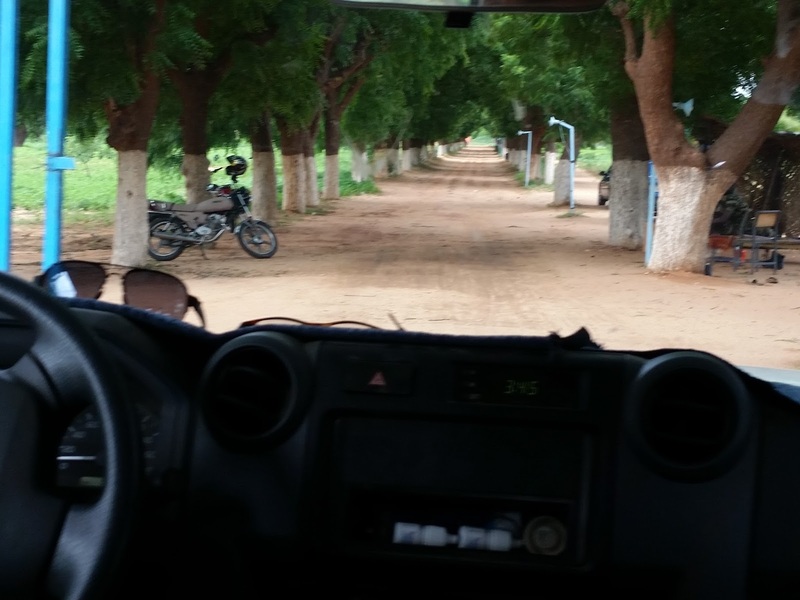 After settling in, one of the missionary families took Dad and I on a walk through the fields surrounding the hospital. 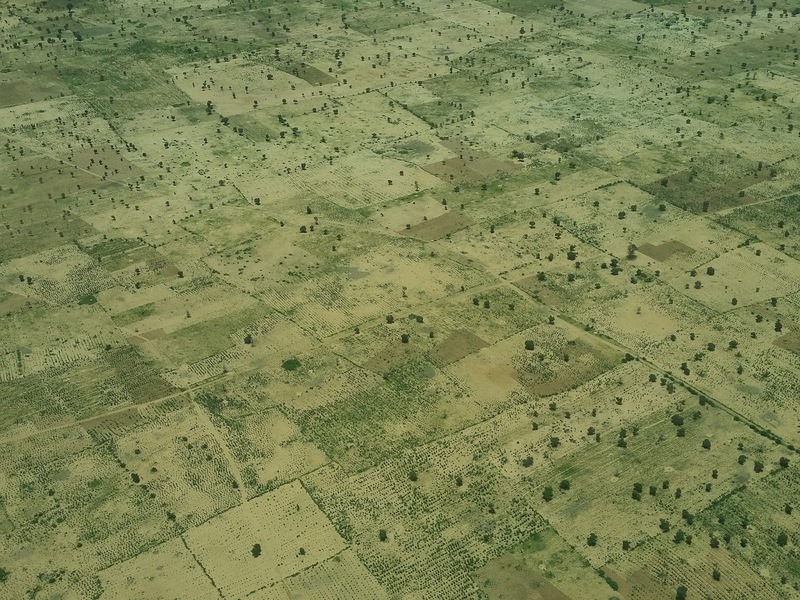 The SIM property is quite extensive, so much of it is farmed by locals, similar to sharecropping. The original idea was to bird-watch, but our friends also pointed out some interesting plants and trees along the way. On Thursday morning, we started off the morning by joining in with staff devotions in the Danja Fistula Center. 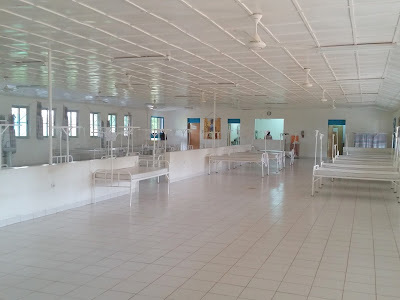 It was in Hausa, and then the director gave some announcements in French, but one of the nursing staff kindly translated for us! 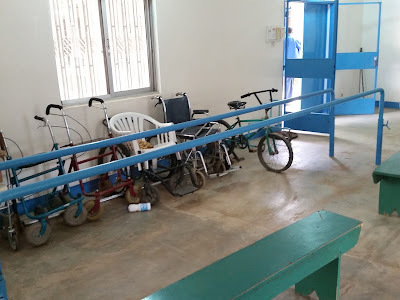 Afterwards, we had a tour of the fistula center and of the rest of the hospital. The ward can have up to 80 women at a time! 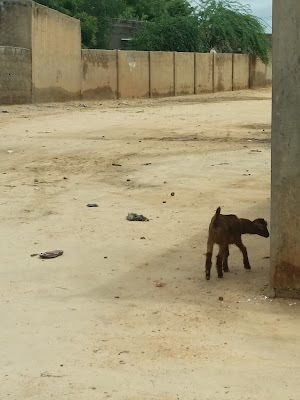 Right now it was empty, as the women had graduated to the village. Like many mission or NGO hospitals, there's a focus on maternal and infant care. 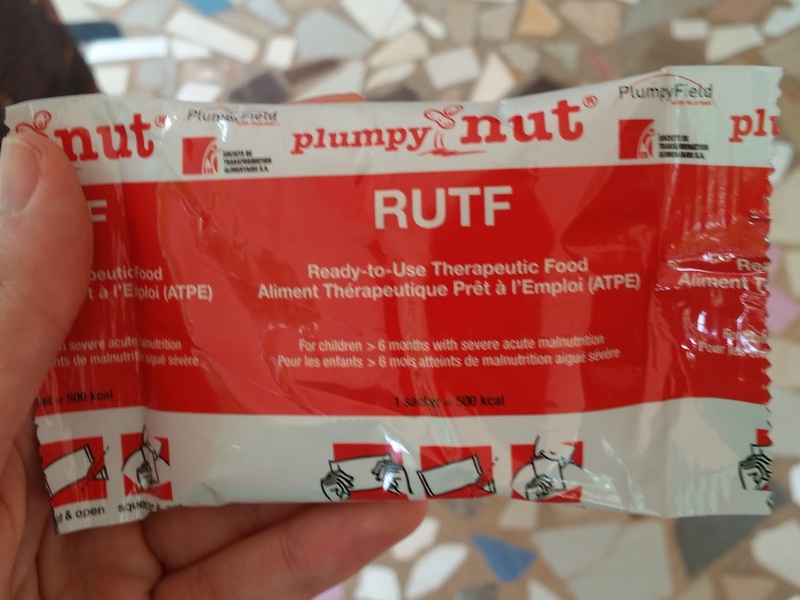 Here, the infant clinic will distribute "Plumpy Nut" to infants and children who are severely malnourished. It requires no mixing and is shelf-stable; all the mama has to do is tear off a corner of the packaging and the paste can be squeezed out, perhaps by the child himself while he is on his mama's back. Plumpy Nut is made out of peanuts and fortified with other nutrients. After our hospital tour, the director's wife took us to the fistula village out back. 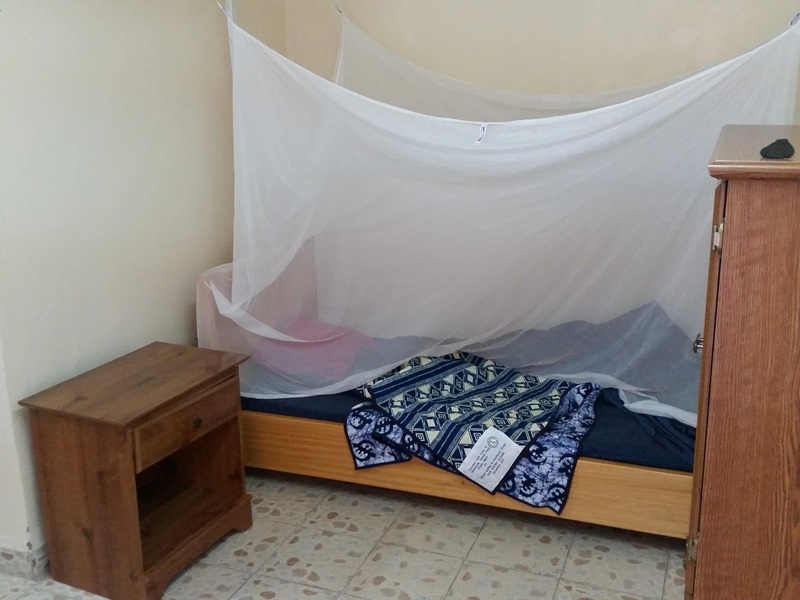 Here, the women will live for about three months while learning to do embroidery and knitting, some basic school lessons, and have the opportunity to partake in a 3x/wk exercise class. 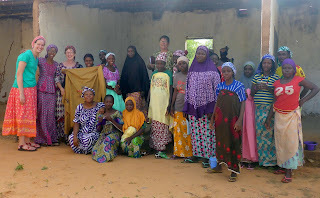 The ladies were gracious to show us the embroidered baby wrappers (fabric lengths about 2m long used to tie babies onto a mama's back) they were making to sell. Gina, the missionary psychologist also spends time with these women sharing Bible stories and doing group counselling/trauma support. 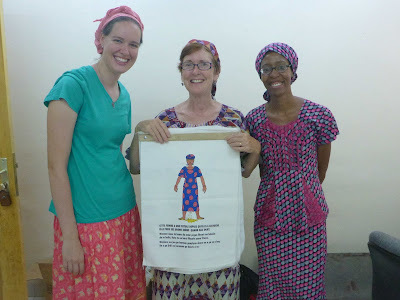 Me, Nancy (director's wife), and Gina (psychologist) holding a tool used for community education regarding fistula and obstructed childbirth. 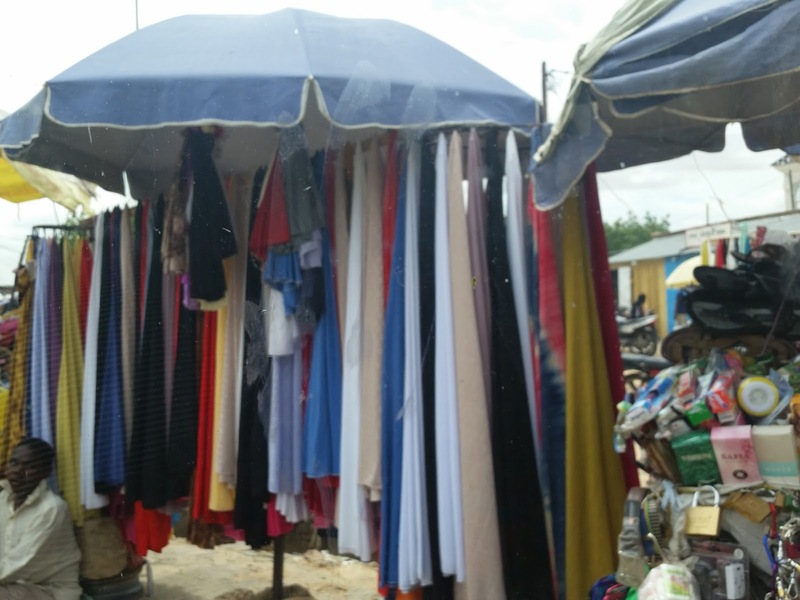 The fabric flipchart uses simple to understand graphics and written descriptions in Hausa, Fulani, and French. I was able to sit in on the group exercise class that Esther runs. 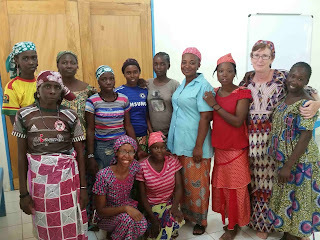 Esther is a Nigerien nurse who received some therapy training from the missionary PT who was just there, and she helps out the Nigerien PT who is over in the hospital. The women have a program focused on core and leg strengthening, and many of them knew it entirely by heart! I was encouraged to see exercises like bridges, heel raises, clamshells, and quadruped leg extensions. I think I just introduced some of the women to their first selfie! In the afternoon, Dad and I had some time to rest at the beautiful guesthouse. We brought our plastic chairs out into the breezeway and enjoyed a cup of tea. We also watched the butterflies and the neighbor's chicken scratching in the guesthouse courtyard. I might have made friends with the pet cat. 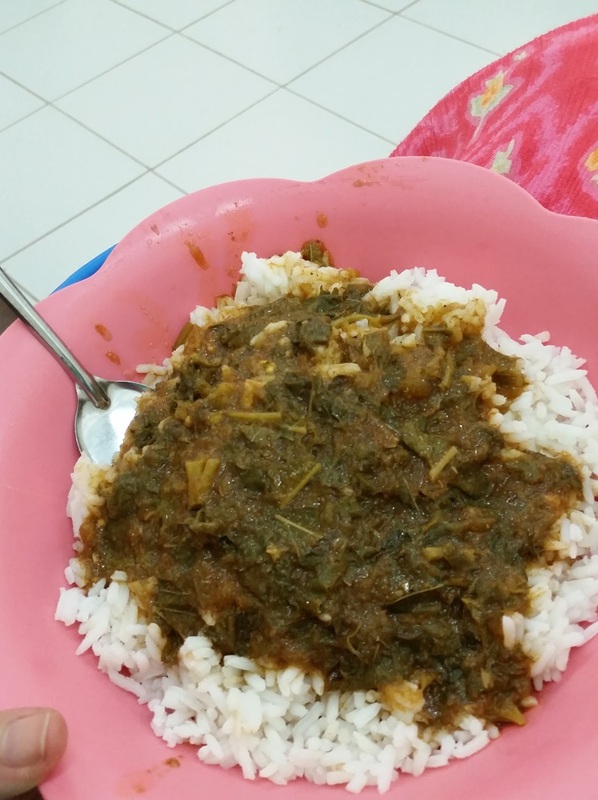 She belongs to the missionary PT who is on home assignment now, so Gina's taking care of her and all the missionary families feed her scraps. She went by "Ugly Kitty" and I never found out her real name! Our rooms were small, but clean. I had an air conditioner unit AND a ceiling fan! This was also the first time the entire trip that we used mosquito nets, praise God! 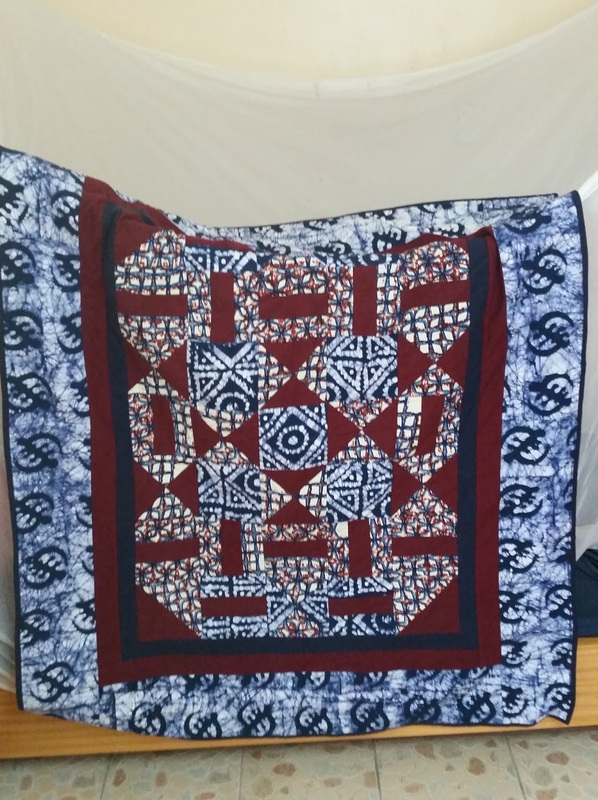 Each room had a small quilt handmade by a quilter's guild in Australia—how cool! 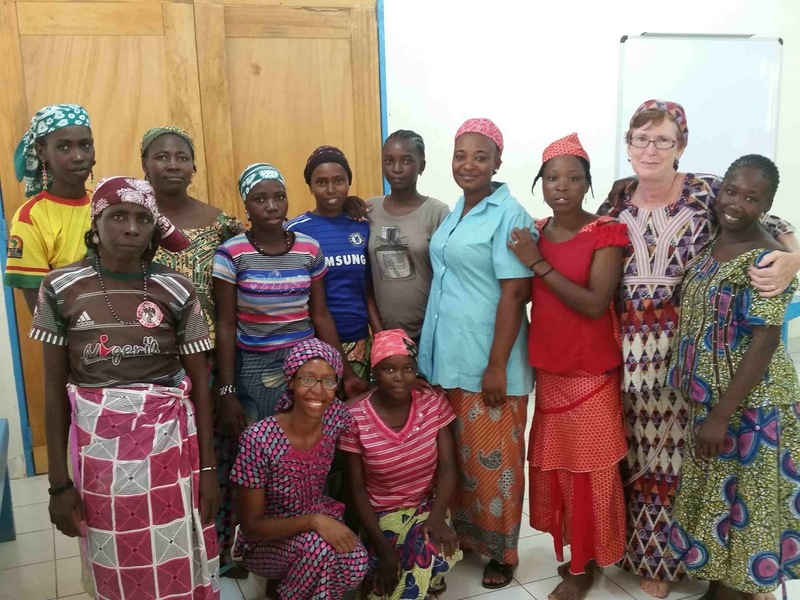 On Friday, we were able to meet Dr. Intengre, the fistula surgeon. 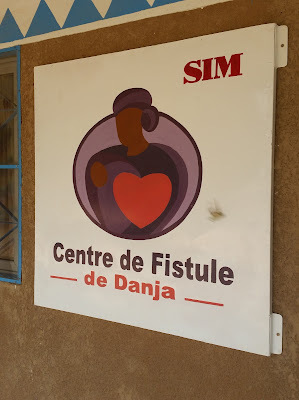 The center is just a few years old and was funded largely by Worldwide Fistula Fund, so there is a lot of potential there! I returned to the exercise class, and this time Esther asked me to show some more exercises. I decided it was easier to advance some of the exercises they were already used to doing than to teach new ones, especially because my knowledge of French matched Esther's knowledge of English! We ate lunch with the director at the hospital canteen. You never know what's going to be on the menu for the day. We were blessed to have "rice and sauce" and a soda for about $2/person. The sauce was made from moringa leaf (a vitamin & mineral-rich plant that's grown in West Africa) and seemed to be mixed with tomato, but I didn't ask. Like Dad says, "if it was good, don't ask what it was!" 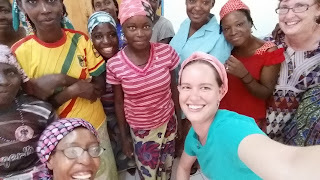 In the afternoon, I went out to the fistula village with Gina as she used Bible flipcharts to tell the story of creation, how sin entered the world, and why Jesus' death erased the punishment for our sin. She'd told pieces of the story before, so some of the women volunteered here and there to help her re-tell it. 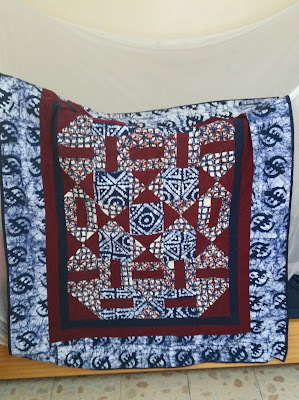 I sat on the ground with the other women under their tin shelter and when I pulled out my own knitting project, I think I made about 20 new friends! I also spent some time with Samalia, the PT who treats all the leprosy, surgical, and orthopedic cases. He is a recent graduate of a PT program in Niger, and he had lots of questions to ask me. I wrote down a few exercise suggestions to better help him treat low back pain (it seems like that's a tough diagnosis for any new PT around the world!) and worked with Esther to develop an advanced set of exercises for her class. I decided to draw the exercises out with stick people so she wouldn't have to try to translate my written description—we both laughed at my horrible drawing skills. 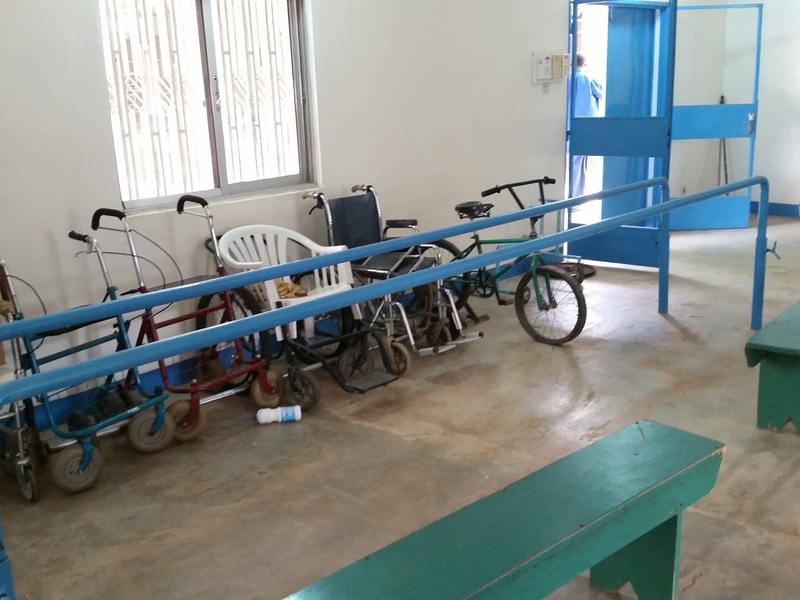 I think every clinic has a stash of walkers and mobility devices! Samalia and I talked through appropriate use of modalities like heat/ice/diathermy (I'd never actually seen a diathermy unit before! ), then he and Esther helped me start a list of helpful words and phrases in English, Hausa, and French. We exchanged email addresses and I look forward to corresponding with him as he grows in his clinical skills and I learn how to treat conditions far more advanced than usually seen in America. On Saturday, we had a few hours to enjoy a cup of tea and both Dad and I to finish our books, then it was time to drive to the airport in Maradi. 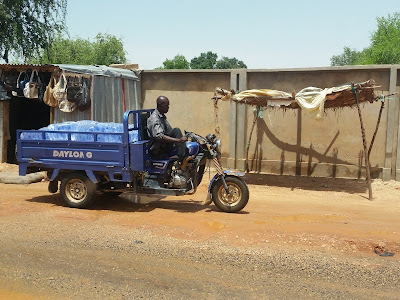 We met Ian again and loaded up for an hour-long ride to Galmi. 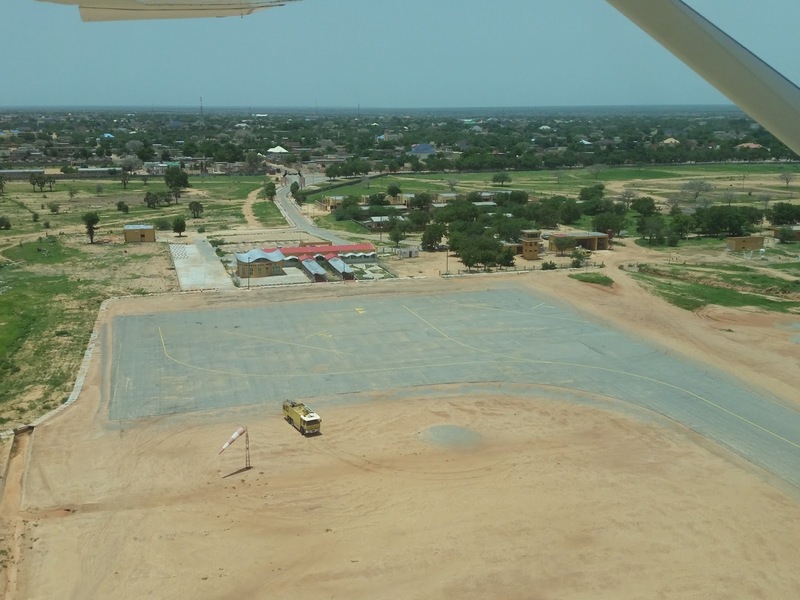 There we picked up another passenger, and then flew back to Niamey. We were taken to the home of the SIM Niger Director. We chatted for a few hours, then they took us out to a lovely restaurant for dinner. We got back to their home about 930pm and Dad and I had to be up at midnight! Our taxi driver came for us at 1230am and took us to the airport in time for our 3am flight. 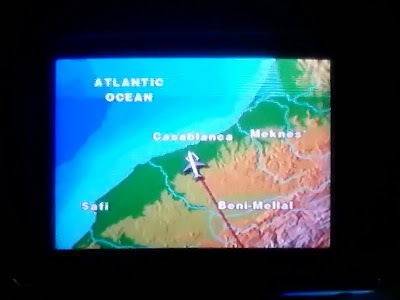 We took quite a circuitous route back home—we went through Casblanca, Morocco; Madrid, Spain; and Miami, Florida! 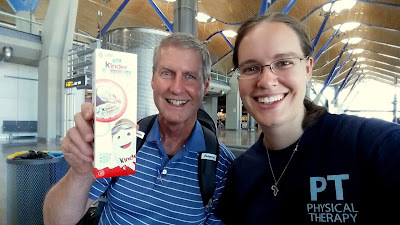 During our layover in Madrid we found a Starbucks and a duty free shop selling Kinder Eggs! If I fly through an airport in a country I've never been to before, does that count as visiting ? If you don't know the magic that is Kinder, you are seriously missing out! Too bad they're illegal in the US due to the small parts being a choking hazard! We arrived home on Sunday, the same day we left Niger—time zones are weird things—and Mom met us at the airport with chocolate and a few of our favorite foods! 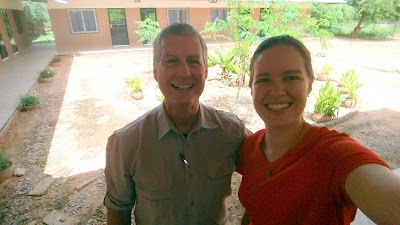 All in all, Dad and I had a great trip and enjoyed meeting everyone, seeing the facilities, and hearing about the work God is doing through SIM in Niger and Nigeria. I remember Dad asking me one day as we were sitting at the Danja guesthouse drinking tea, "So, do you know where you're going to go?" I told him my thoughts, and he agreed with me. God couldn't have been more clear! So, where am I going? Well, you'll just have to wait and read the next post!